Whichever way you stand, the Sorbus Anti Fatigue Standing Mat brings the ultimate comfort and support. Forget the fuzzy slippers, enjoy the comfort of luxurious thick gel padding that feels like you're standing on a cushion of air. Reduce tension and relieve the pressure on your heels, back, legs, and shoulders that come from standing on hard surfaces and lead to lack of productivity. Designed for any flat surface area, this mat features non-slip, spill resistant technology that reduces the risk of trips and is easy to clean. Stand up to the heavy-duty demands of the home or workplace with confidence. 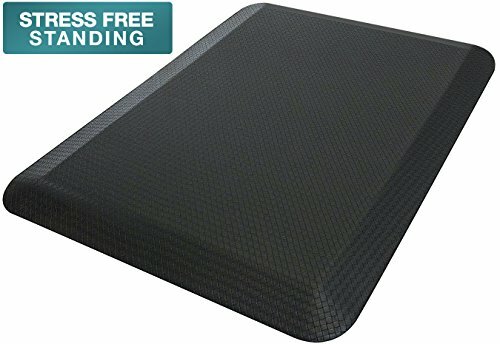 After your daily bath or shower, step onto a non-slip mat that keeps the cold floor from freezing your feet. In the kitchen, place in front of the stove and comfortably prepare that holiday feast for extended family and friends. If dishwashers still aren't your cup of tea, drop a mat in front of the sink for dish washing or while prepping fruits and veggies. Add luxurious cushioned mats to the laundry room while folding your essentials for those extended laundry days. Create a computer workstation designed for a productive 8+ hour work day between standing and sitting positions. Promote a healthy work environment in commercial settings such as health care, hospitality, spas, salons, coffee shops, and more! Invest in yourself or your business with this life changing accessory! Engineered for exceptional comfort with a combination of leisure and technology. Don't wait! Add multiple floor mats for additional comfort.